About a year ago today I was looking up how to make a rainbow cake for housemate M's birthday when I stumbled across this post by Whisk Kid. It got me thinking how great blogging is for showing the world what you've made, and why couldn't I do the same thing? 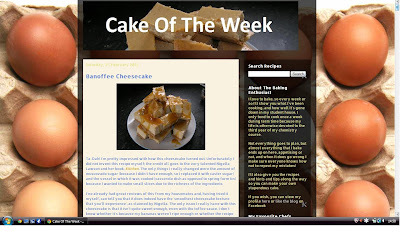 A few hours later, Cake Of The Week was born and a year ago I posted my first recipe: Flapjacks. I have 82 posts, so clearly I have made more than one cake per week over the past 12 months. Some of these are horrendous disasters - Giant Chocolate Cupcake, anyone? Most of them are great successes, however, and I think the cakes I am most proud of are the Eight Layer Kahlua Cake, the Pina Colada Cupcakes (purely because of those flamingos, though they did taste fantastic) and the Cinnamon Raspberry Cake, not only because it looks good but also because it was the first time I got Swiss meringue buttercream really right. I've always maintained that anyone can bake, which is why I made a page called The Basics so that those who need a little more instruction than is given in the recipe can get the help they need. Of course, I still have skills to master, but I try to help where I can. When I find the time I want to write a page about different types of buttercream: by no means do I know about them all, nor do I claim to be an expert, but until I started this blog and started reading sites like Sweetapolita and iambaker I never knew that there was a buttercream that did not involve icing sugar. My mind was blown! I feel this might be the case with a lot of bakers out there so I want to spread the word as best I can. To be frank, since making Swiss meringue buttercream and French buttercream I've become less enchanted with the icing sugar version and now find it too sweet; unless I'm making cupcakes I think it belongs on celebratory cakes made for other people, and that's about it. After spending a lot of time on my growing list of favourite blogs, I decided that mine was far too dark and busy, so I thought it best to simplify things. I took inspiration from what I saw as the most popular blogs in my blogging community, such as Belleau Kitchen, Sharky Oven Gloves, Sweetapolita, iambaker and Chocolate Log Blog, and gave the blog a bit of a makeover, the results of which you see right now. One of my biggest interests is making food better for you, be that lower calorie, lower fat or lower sugar (I know that salt is often a big culprit in people's diets too, but I rarely add it to food, particularly when it comes to baking). I started experimenting with different products and thought I'd make a place where readers of my blog can go to find out how to make their own baking healthier - Healthy(ish) Baking. One of my first real experiments in this area was using mayonnaise in place of butter in my Healthy Brownies, which was incidentally my first entry to We Should Cocoa. I don't think my blog would have half as many readers without my entries to blog challenges like We Should Cocoa, Simple And In Season, Alphabakes and the One Ingredient Challenge. Not only is it fun to take part, but the round-ups showcase all the entries to the challenge hosts' readerships, which really helps to draw people to your site when they see what you can come up with. Last month, I started my own challenge, Baking With Spirit, which will hopefully bring more readers to my site as well as getting everyone involved in another fun challenge. In short, it's been a fantastic year of blogging. I've learnt so much and have had so much inspiration from other bloggers, which has pushed me to improve my baking and decorating skills. Not only has blogging been great fun, it's also introduced me to so many talented people - if I miss a day of blog posts, it's becoming near impossible to catch up to them all! My favourite blogs are listed on the right, but the list is by no means exhaustive. Let's move on to today's cake, then. Unfortunately, the cake did not work out as it looked in my head (I had pictured something like this) - the peanut butter cloud icing was a little bit too soft so it didn't hold its shape on the sides of the cake too well, and I couldn't get the ganache to drip in the correct manner, so in the end I gave the cake a swirled effect instead. Inside is a banana sponge sandwiching a milk chocolate cloud icing (invented by Sweetapolita - the peanut butter icing was also based on this recipe, with the chocolate swapped for peanut butter). I kid you not, the milk chocolate icing tastes just like a kinder egg. I dare you to try a bit before you smother the cake with it. All in all, the cake is totally delicious. Texture and flavour-wise, the cake is just as I had hoped; I especially love how the icing just melts on your tongue. The cake may not look as envisioned, but as ever I think I managed to overcome potential disaster and pulled it off in the end. In a way, I suppose this is rather fitting as it sums up many of my baking feats on this blog. If you're a peanut butter, chocolate or banana fiend, I wholeheartedly encourage you to make this - I can guarantee that you won't regret it! If you like the way I had originally pictured the cake, I think a Swiss meringue buttercream with 125g peanut butter whisked in would work as a better alternative to the peanut butter icing used here. To make the banana cake, cream the butter and sugar together until light and fluffy, then beat in the eggs one at a time. Sift the flour and baking powder into the bowl and gently fold into the batter until smooth. Add enough milk to achieve a soft dropping consistency. Peel and mash the bananas, then fold them into the cake batter. Divide the mixture between the sandwich tins and bake in the oven for 22 mins, or until a skewer comes out clean. Allow the cakes to cool completely, then wrap them in cling film and freeze for at least four hours, and a maximum of five days. To make the milk chocolate icing, melt the milk chocolate in a saucepan and allow to cool. Whisk the butter and icing sugar until smooth, then beat for a further minute. Whisk in the melted chocolate, then beat for a further two minutes. Place to one side. To make the peanut butter icing, beat the butter and icing sugar together for one minute, then add the peanut butter and whisk for two more minutes. Place to one side. To make the chocolate ganache, place the dark chocolate and water in a small saucepan and stir whilst heating until they are fully combined, then leave to cool. To assemble the cake, unwrap the cakes and place one on a plate. Cover the cake with the milk chocolate icing, spreading it right to the edges. Place the second cake on top, then place three tablespoons of the peanut butter icing on top and spread a thin layer all over the cake,filling any gaps as you go. Place the cake in the fridge for 30 mins so that the icing firms up. Spread the rest of the peanut butter icing over the cake, making sure that the sponge is completely hidden from view. Place a couple of tablespoons of ganache on top of the cake, and use the spoon to ease it over the sides. Add more as is needed. The great thing about this cake is that all of its components can be made in advance: the icing and ganache can be stored in the fridge until you need to use them and the sponge can be frozen for up to five days - after this it gets very crumbly once defrosted. For tips on making this cake a little more healthy for you, take a look at Healthy(ish) Baking. Thanks to everyone who has read and supported Cake Of The Week, and to all of the Baking With Spirit entrants, and here's to another year of baking! Haha,I also liked that one - it was hard to pick favourites! Thanks! Happy blog birthday!! I feel so honoured that you took some inspiration from my blog. Truly. This cake sounds utterly delicious, even if it didn't quite turn out how you intended (I totally know how that feels!). I'm especially intrigued by the icing that tastes like Kinder eggs… I love Kinder eggs far more than I should as an adult. Thanks! You should definitely try the kinder-egg style icing - it's one of the ones where I have to force myself to resist eating the entire thing before even putting it on the cake. Congratulations on your first blogoversary! It's a great achievement and I hope there will be many more years to come. You are definitely speaking my language with this peanut butter, banana and chocolate cake - drool! Thanks, Choclette! I was definitely saddened when the last piece of this cake was gone, but I suppose that means it's an excuse to make it again!